Past Events & Photos - Molding Minds: Creating Powerful Purposeful People! Molding Minds received a beautiful plaque to display the names of our scholarship winners!!!! Molding Mommies is proud to host a Mother's Day Sweepstakes in collaboration with NWCA (Navy Wives Club of America Norfolk #91 Chapter). Strong mother's create strong families. We believe that all mothers, from all walks of life, should be acknowledged for their tireless efforts and never ending sacrifice. All of the lucky winners will be chosen from the "Marvelous Moms" essay & art contests being held at several after-school program sites throughout Hampton and Newport News. This contest is open to children ages 6-17 and all entries must be received no later than May 1, 2014. We are excited to pamper a few marvelous moms from the communities that we serve in honor of mother's day! The contest is done and the winners have won! Drumroll Please....And the winners are: 20 Amazing Moms from the Hampton Roads area! The Molding Minds Mother's Day contest was a smashing success. 20 winners were chosen from the 72 essay and drawing entries that were received from contest participants at the Boys & Girls Club Lincoln Park Division and Old Hampton Community Center. The entries that the children completed were so amazing that we decided to give ALL 20 moms a gift basket instead of choosing 1 winner. Check out the photos from the event and take a look at the great things that God is doing through our organization! The Molding Minds team proudly posing with our scholarship winner! The awesome student that won the Molding Minds Scholarship.......phenomenal mother of two pursuing higher education! Thank You Navy Wives Club of America! Molding Minds would like to thank the generous ladies of the Norfolk #91 Chapter of NWCA. Special Thanks to Maribel & Debra who went above and beyond to make this effort an amazing success. 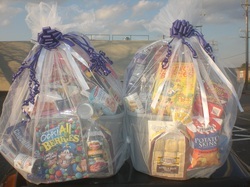 The baskets were delivered to needy families in the downtown Newport News area. Not only did they include Thanksgiving dinner with all of the trimmings but they also had breakfast items and snacks for the families. They will feed two large families consisting of 2 single mothers and a total of 10 children....needless to say they were extremely grateful and overwhelmed with joy as they received the baskets with open arms. On behalf of Molding Minds and the families who received the baskets we would like to extend a heartfelt thank you to all of the ladies who donated turkeys, trimmings, and funds to this cause. May God continue to bless you for your charitable efforts in helping those in need. 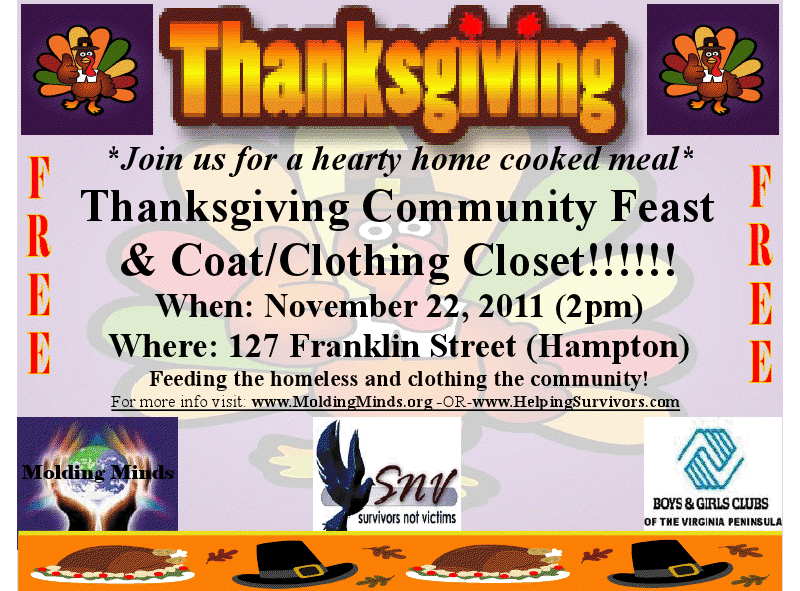 Molding Minds partnered with Hampton City Schools and Community Colleges to collect coats for the community! Each year this effort continues to expand to more locations as new schools join the ranks of community helpers. We hope that you join us next year in our efforts to help our students embrace the spirit of community service. Special Thanks to the George P. Phenix PreK-8 Junior Honor Society for collecting over 200 coats! Molding Minds Community Service Award Winners! was a HUGE success as we were able to provide coats to over 400 people in the community. Warm Coats=Changed Lives coat drive a smashing success!